The Netaji scion and BJP candidate, Chandra Kumar Bose asserts it is not a clash of personalities - rather a fight for development against neglect. It’s a fight between BJP’s development and Trinamool’s misgovernance: Netaji`s grand nephew. 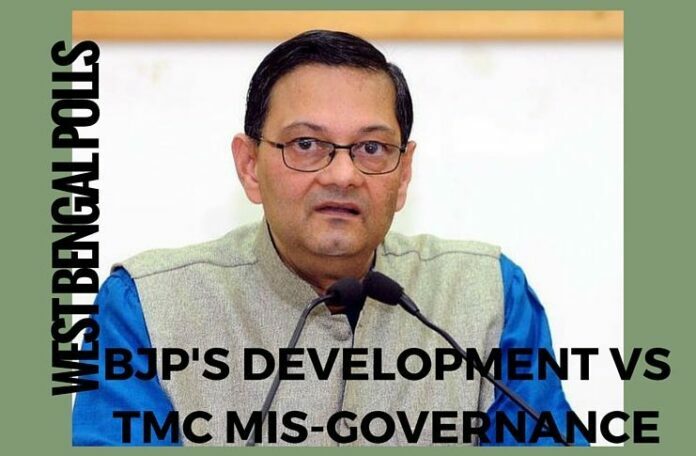 [dropcap color=”#008040″ boxed=”yes” boxed_radius=”8px” class=”” id=””]H[/dropcap]e may be a political greenhorn pitted against battle-hardened adversaries, but Netaji Subhas Chandra Bose’s grandnephew Chandra Kumar Bose is hopeful of emerging as the David slaying the political Goliath. He aspires to uphold the revolutionary leader’s ideals of nationalism in mainstream politics. Taking on the might of Trinamool Congress supremo and West Bengal Chief Minister Mamata Banerjee from her stronghold South Kolkata’s Bhowanipore in the assembly polls, the Netaji scion and BJP candidate asserts it is not a clash of personalities – rather a fight for development against neglect. Bose, joined the saffron party earlier this year. He says that the electoral contest has given him a great opportunity to be a worthy soldier of the BJP. [dropcap color=”#008040″ boxed=”yes” boxed_radius=”8px” class=”” id=””]”I[/dropcap]t is always better to fight against someone who has established herself rather than fighting a non-entity. It’s not a clash of personalities, rather a fight between the BJP’s agenda of development and the Trinamool’s misgovernance and neglect,” the 55-year- old Bose said when asked about being up against the formidable Mamata Banerjee. “From industry to law and order, from health to education, there is complete anarchy and the state is steadily heading towards destruction,” he said, while going door-to- door and interacting with the voters. One of the state’s most cosmopolitan constituencies – home to sizeable number of Gujaratis, Sikhs, Biharis, Marwaris and various other communities living alongside Bengalis – Bhowanipore has over 200,000 voters. But Bose said even Bhowanipore, despite being the chief minister’s constituency and housing her residence, lacked many basic amenities. Drawn to the BJP by “country’s foremost nationalist leader” Prime Minister Narendra Modi, Bose’s aspiration behind taking the political plunge is to “establish Netaji’s ideal of nationalism in mainstream politics”. [dropcap color=”#008040″ boxed=”yes” boxed_radius=”8px” class=”” id=””]D[/dropcap]efending his decision to join the BJP instead of the All India Forward Bloc founded by Netaji, Bose said: “The irony is the Congress and the Left parties, who have successfully obliterated Netaji’s ideals and beliefs, are now pointing figures at the BJP. The most communal party in the country is the Congress which has been instrumental in numerous communal riots since independence. “And the most unfortunate thing is the All India Forward Bloc preferred to join hands with the Left, forgoing Netaji’s principles,” says the grandson of Netaji’s elder brother, Sarat Chandra Bose. Having actively campaigned for the de-classification of secret government files on Netaji, Bose refuses to give any credit to Banerjee for making public 64 classified files last September, nearly four months ahead of the centre coming out with 100 such secret files on January 23. “On the other hand, it took Modi just over a year to declassify the secret files which contain far more critical information. Not only that, his government has been constantly endeavouring to get foreign governments, including Russia and Britain, to declassify files in their possession,” said Bose, claiming the centre has already handed over at least 700 more classified documents to the National Archives of India which will come in the public domain shortly. [dropcap color=”#008040″ boxed=”yes” boxed_radius=”8px” class=”” id=””]H[/dropcap]aving worked nearly two decades as a management consultant with a global enterprise and a voluntary human rights activist, the London-educated Bose affirmed his experience of dealing with the masses would help him at the hustings. “Our ancestral house has been in Bhowanipore, so I know the people, realise their problems and their aspirations,” he said refering to Netaji Bhavan located in the area. Bose claimed his newcomer tag would also work to his advantage. “Often politicians make tall promises and then forget. And I, being a non-political persona, people will give me their support,” added Bose who has been holding marches, and urging the people “to hand over the state’s baton to the BJP”. Here is an excellent post on Netaji SC Bose files: Here is what we know so far.